Jamie was born and raised in south Oklahoma City along with three brothers. 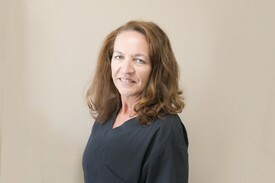 She graduated from University of Oklahoma and has been practicing Dental Hygiene for 30 years. Her extended family includes her husband, Fred, and 4 great nieces and nephews which she loves like grandchildren. 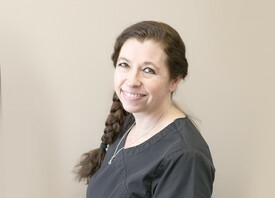 Jamie has been with Dr. LoVette since 2009 and is a treasured part of this great dental team. Debi, having 6 years in the dental profession, was thrilled to join our team in July, 2013. She enjoys being a dental assistant because she enjoys being able to give the best quality care with sensitivity and understanding. Debi has three children. Annye is in high school and her grown children, Jeff and Roni, live in the Oklahoma City area. She loves to spend time with her family and enjoys hanging out with friends. 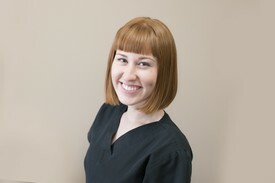 Nicole grew up in the Tulsa area and moved to Oklahoma City to attend college and dental hygiene school. She enjoys travel, spending time with her puppies and good food. Cora, our office manager, is the first person you will most likely speak with upon calling the office. She has been with us since 2017 and is a great resource for your insurance, billing and dental questions. Cora has two children, Kevin and Kaley, and is from the Oklahoma City area. She enjoys spending time with her family and friends.